The funny thing about summer in central Texas is no matter how the sun tries to beat us back indoors with its intense, intense rays and scorching heat we still manage to defy it. We find ways to cool off and enjoy the outdoors despite Mother Nature’s obvious cohorting with the AC companies. There’s no better way to stick it to her than with a family picnic. Even when drought conditions loom, Austin has a number of lovely picnic spots that are just begging to have a blanket thrown out and a basket full of food eaten al fresco. Few people know there’s a zoo in Austin. 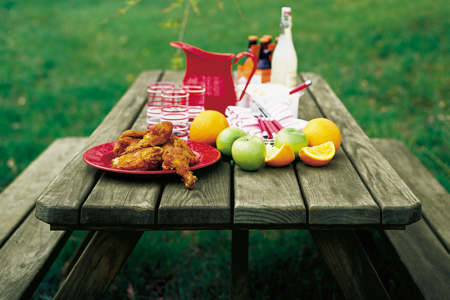 Even fewer know that the zoo has a picnic area and visitors are encouraged to bring a lunch along. So pack up a picnic and have fun checking out the 300 animals that call the Austin zoo home. If you’ve ever been to Deep Eddy you’ve probably seen the “dog area” on the other side of the north fence where Barton Springs continues to flow out to Lady Bird Lake. The shoreline on the west side is dotted with small shaded spots perfect for a small group to relax and nosh when they’re not taking a dip. Situated downtown just south of Lady Bird Lake is the green lawn of Auditorium Shores. This aptly named spot is the venue for a number of musical events. On Sundays during the summers you can enjoy a picnic there while listening to the Austin Symphony put on a free show. Tucked away off the Pennybacker Bridge just south of 2222 and 360 is a trail that leads you up the hillside. Once you reach the top you’ll find a clearing and breathtaking views. This a rudimentary spot with no amenities so plan accordingly. If you’re looking for a picnic spot with all the extras, head just north of Austin to Cedar Park’s Elizabeth Milburn Park. During breaks from eating you can play a game of beach volleyball, basketball, soccer or tennis, swim in the pool, play at the playground and hike or bike the trails. It’s sometimes hard to believe that a large state park is located within the city limits. But there McKinney Falls is in south Austin. The 700-acre park offers picnicking and camping year round. During the warm months, when there’s been some rain, you can splash around in the falls, which is one of the most scenic swimming holes in town. The acres of wide-open spaces at Zilker Park are used year-round for a variety of events (ACL anyone?) including picnics. With six full service group sites that can be reserved this is among the best picnic spots for family reunions, company picnics and other large groups.